Most of the frescos in San Maurizio were painted by Bernardino Luini, who was a contemporary and admirer of Leonardo Da Vinci. 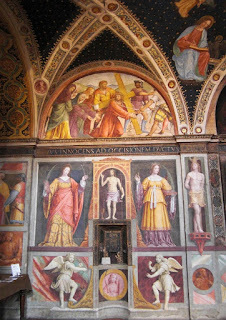 Saint Apollonia and Saint Lucy stand in the Hall of Nuns, below a lunette with Christ bearing his cross. 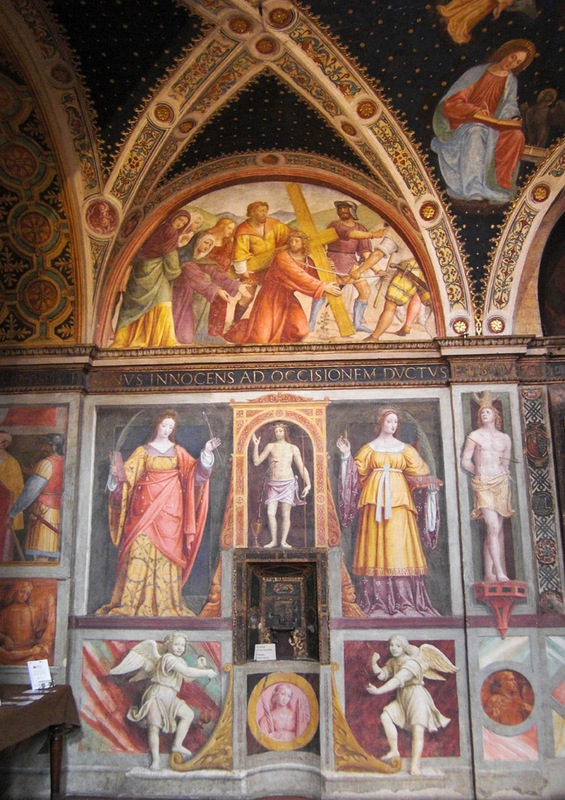 It’s easy to imagine the nuns contemplating the glowing colors of Luini's frescos as they sang and prayed. Part of a Roman-era wall still remains at one end of the church, where there is now a museum. How fitting that such a wall remains on this site. St. Maurizio was a Roman soldier who persecuted Christians but eventually converted to Christianity. He spent the rest of his life trying to stop the persecution of his fellow Christians.